Happy Monday. If I ever needed a pick-me-up it is this week, so what’s better than a little music – outdoors – for free – via crowdsourced pianos. Piano placed in Volunteer Park, Seattle. Seattle and the Great Northwest are known for their natural beauty. And there is no greater place to enjoy nature locally, than within the hundreds of Seattle and King County parks and open spaces. Regardless of where we live, work or play, parks are great economic equalizers – providing us all with venues for relaxation, exercise, recreation and entertainment. Seattle and King County is also known as a place where music and the visual and performing arts all thrive. In the Pianos in the Parks public-private partnership, some of the region’s leading music and arts organizations have come together to encourage us all to discover our parks. It all starts with an alluring piano. 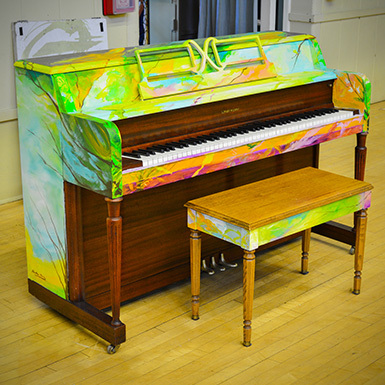 And not just any old piano – these pianos have been donated, restored and tuned by Classic Pianos and dynamically designed by the students, faculty and friends of Gage Academy of Art. With partners like Seattle Symphony, KEXP, and City of Music who knows who you’ll find tickling the ivories of one of these pianos? From baseball to dog parks, concerts to picnics – we all now have another reason to DISCOVER OUR PARKS: the PIANO. ENJOY! via About Pianos in the Parks » Pianos in the Parks. Other cities have done this or similar projects before, so it is great to see this sort of project come to Seattle. Find a piano near you!